From the time when I was a small child, I’ve always been a huge fan of banana splits. Whenever we’d go to a restaurant, I’d actively seek it out on their dessert menu and then bug my parents until they would order one for our table. They’d try to pretend that we’d all have an equal share of the banana dessert, but they knew that once that bowl hit the table it was all mine. Sure, I’d give them small portions, but there was only so much of my banana split that I’d be willing to sacrifice. I’ve since learned how to share my desserts better, but I’m still utterly obsessed with the taste of a banana split. After all, it’s just so incredibly hard to beat the classic taste of a sweet banana split. There are so many different flavors in a banana split that each bite is a new experience. Bananas, chocolate, strawberries, and a bit of pineapple come together in a way that I would never have thought possible. Now that I’m older, I’ve learned that it’s possible to incorporate the flavors of one type of dessert that you love into a different kind of dessert. For instance, I’m a huge, HUGE fan of the Root Beer Float Cupcakes that we have on TheBestDessertRecipes.com. They’re really the best of both worlds. So, when I was thinking about what I wanted to make in our Test Kitchen this week, I kept returning to the idea of a banana split cake. Then I had a giant light bulb go off in my brain. 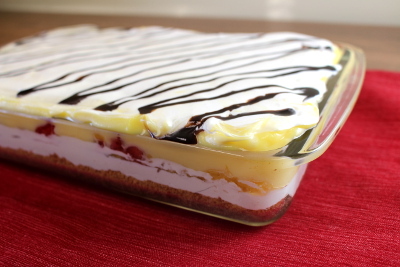 I thought to myself, “Why don’t I make a banana split dessert lasagna? They are much easier than banana split cakes.” Dessert lasagnas have been really popular lately and I’m definitely a huge fan of them. I mean, how could you ever turn down a deliciously creamy layered no-bake dessert recipe? The answer is: You can’t. So, I browsed a few bloggers for recipe information and got to work creating this Banana Split Lasagna to share with all of you. I picked up all of the ingredients that I didn’t already have in my kitchen in a simple trip to Walmart and got to work. This dessert has five different layers: a buttery graham cracker crust, sweetened cream cheese/whipped cream, sliced strawberries and crushed pineapple, banana cream pudding, and a not-to-be-missed Cool Whip and banana split-fixin’s to top it all off. It’s absolutely delicious, if I do say so myself. The only issue I had making it was waiting for it to firm up in the refrigerator. I jumped the gun a bit because I couldn’t wait to try it, so it was a bit messy. Positively divine, but messy. So, do what I didn’t and make sure to wait for your dessert to set. That is unless you don’t have to impress anyone with the banana split dessert! I didn’t try it, but if you’d like to add more chocolate into your lasagna, consider mixing in a bit of cocoa powder in with the graham cracker crust or sprinkling the dessert with mini chocolate chips. Update: It’s been one year and this recipe is still going strong! I hope you enjoy my banana split dessert, and don’t forget that Recipe Chatter has tons of yummy dessert ideas. Hi there – thanks for your message! We suggest that you go to the page and highlight the text, then right-click on it. You’ll get a window that gives you the option to “copy.” Do that, and then paste the text into a word document. You should be able print that document that way. Another option is to highlight exactly what you would like to be printed. Then, select “print” from your drop-down menu, and change your print range from “all” to “selection.” Hope this helps! Just wanted to say thanks for you last printing instructions; namely: Another option is to highlight exactly what you would like to be printed. Then, select “print” from your drop-down menu, and change your print range from “all” to “selection.” I never knew I could do this in nearly 20 years on the computer and am so excited to learn about this option. Will be trying the desert for Thanksgiving with some minor modifications. I’ll be adding: sugar to the graham cracker crust, a layer of sliced bananas, separating the pineapple and strawberries into separate layers (strawberries on top of crust, pineapple in current position, banana’s on top of banana pudding and under cool whip), drizzling caramel and chocolate on top, as well as, rinsed and carefully dried maraschino cherries with the stems on top and chopped nuts, probably peanut. The grandbabies will love it (Grandma and everybody else too). Thank you. I would like to try this but they are people who do not like pineapple, especially me. Can I put some thing else like banana’s or blueberries. I would have put some bananas in it in the first place. I like to use crushed vanilla wafers for the crust layer. Hi Helen, Right above your comment you’ll see two different methods of printing just the recipe and nothing else. You can either copy the recipe into a Word Document and print it that way. You can also highlight the whole recipe, right click on the highlighted portion and select “print” from your drop-down menu, and change your print range from “all” to “selection.” Please let me know if neither of these methods work for you and, if they don’t, what specifically isn’t working. I’d be happy to help! Just a little comment on how to print—-I learned how to in a typing class in college where I also learned to use the computer instead of a typewriter!! Jo, you can also use Print Friendly. Just Google it and the instructions will be on their website. Copy and paste the sections you need to a document text sheet, save as (give title), Now you can print it and create your own recipe folder. To print, click on the printer button (far right) under Share and Enjoy at the bottom of the page. A pdf windo will open up. Click on pictures and sections of text you don’t want to delete them. Copy and past just the recipe. I right click, my printer gives me the option to “preview print”, click that and at top of page, click “as selected on page”….this removes everything except recipe…. Wouldn’t it be better to cook the graham cracker crust for a bit….wouldn’t it just crumble when you serve it? Or is that the desired texture when you eat it? Hi Debbie, It’s up to you! It does crumble a bit when you serve it, but it doesn’t completely fall apart. If you’d like to bake it for a bit, go ahead. We just wanted to keep the recipe simple and have it be a no-bake treat! My mother made this when I was a child. (I’m 61 now), When we made it we would put the crust in the freezer until we were ready to add the filling. She just called it Banana Split Cake. We would substitute cherry pie filling once in a while for the strawberries. It was one of our favorites. She never used pineapple but used real bananas as well. If I thought it was too runny when I made it I put it in the freezer until we were ready to eat it. COPY AND PASTE TO YOUR WORD PROCESSOR. There are no bananas in this recipe, I will put them in mine. BEE, if you figure out a recipe WITHOUT pudding (I HATE it) please post it. I will make this for my cousin’s birthday since she LOVES banana pudding and banana splits. My mom made banana pudding when I was a kid and for some reason I fell out of love with most deserts, except her homemade caramel pecan cake she only made for Christmas. DELICIOUS! I would like very much to have this recipe. I love to cook, and my family really likes the recipes that I get from the test Kitchen. Is that 1/4cup of sugar? Yes – 1/4 cup sugar. Thanks! What is step 3 in the directions? It is blank. Thanks for noticing – there was an extra number in the list, but all the instructions are there! verry good, verry nice and verry taste. IT DOESN’T SAY WHAT TO USE THE 2 T. OF MILK FOR. I’m sorry about that. The 2 T of milk should be added into the cream cheese mixture. I had put all of those ingredients together in my list but simply forgot to include the milk in the step. Thank you for catching that. You should be able to cut and serve the lasagna in a (relatively) neat square. The only reason why the photos above look a little messy are because we were too impatient to let it chill all the way! I was wondering the same thing. If I take this to a potluck, I’d like it to look as appetizing for the last person as the first What can I do to prevent it becoming messy looking? Can I actually freeze it? Bananas freeze well in desserts, pudding pops are frozen pudding, the whipped topping is frozen, so if all the individual components can be frozen, I would think the finished product could be as well. And I think a pancake turner would do a neater job than a big spoon to remove your serving. Right? Can you use fresh strawberries instead? Hi Jo – Absolutely, this would be great with fresh strawberries! This dessert looks wonderful and comparitively easy to make! My grange is having a contest and I am going to make this and enter it in the dessert category. I will give credit to where I got it and where they can go to get these wonderful recipes, as that is the rule if not your own recipe. Just to let you know.. I will let you know what what ribbon I get it any..I am sure I will though….thank you for you wonderful recipes! I am definatrly going to try this. I think I will use Oreo Cookie Crumbs instead of graham crackers though. This sounds absolutely delicious – I can’t wait to make it! I think I’ll try it this weekend. Any suggestions for fruit other than pineapple. It’s OK but I’m not really fond of it. I don’t know how to do all that rigemarol on how to print this off so I guess I will pass on the recipe .. Sorry .. But not everyone knows how to do evreything on a computer …..
Regina, how come you couldn’t just write it down?! Thank you a hundred times over! I cannot believe all the complaints from not being able to print the recipe or how much ink the photo will use TO not liking pineapples and can other fruit be substituted! Has there been an epidemic of lobotomies I had not heard about? People: Use that blob of brain matter your neck is holding up and use your best judgement. Did you really take the time to explain that? Just don”t do it. Some of these comments are unbelievable. I just finished making this and it’s chilling. I didn’t have any vanilla so rather than making a trip to the store just for that…I left it out. Instead of 2 boxes of banana pudding I used 1 banana and 1 chocolate with a layer of vanilla wafers in between. Drizzled the top with chocolate sauce…and topped with chopped peanuts. I would put in a layer of banana’s and use a vanilla and banana pudding! Yes! Bananas, I KNEW something was missing. Put them in that drained pineapple juice so they don’t turn dark. mmm, I can hardly wait to put this together! Made this dessert for my Bonco party. It was a great hit. Can this be frozen? You should google Can I freeze pineapple. I seem to recall that it’s a problem. What could I substitute the pineapple for? Hi Donna – If you don’t care for pineapple, you may simply leave it out! If you want to copy it, just highlight what you want copied then hit ctrl & p (for print) it worked for me!! Does the graham cracker crumb layer with butter not need browning as in other recipes? My favorite dessert growing up was the cake my mom would make. It was a chocolate chiffon cake with chocolate whipped cream frosting. Oh it was delicious. Where do the Cheeries go on the pie? what is banana dessert ??? Have you ever tried freezing this and then thawing before serving? I need to make a dessert several days ahead of an occasion and this sounds really good. Hi Barb! We didn’t try freezing it, but this dessert can be made a couple days in advance. Just cover and refrigerate it until ready to serve! Can you use 1% milk? I just wanted to know why you had to grease the pan? My favorite dessert as a child we called ‘Christmas Dessert’, because it was only served after Christmas Dinner. The actual recipe calls it Whipped Cream Jello Pie. I remember thinking the recipe was long and tedious thus the reason it was only served once a year. I remember pineapple juice, gelatin and sugar being dissolved on the stove and left to cool while whipping cream was beat into stiff peaks. They were then folded together with the pineapple along with 3 different kinds of Jell-O, usually cherry, lime and lemon, for the Christmassy colors. The Jell-O had been mixed earlier with less water I believe, poured in round cake pans and put in the fridge to chill and jell. Then with a butter knife they were cut into very small squares before being scraped out of the pan with a spatula and folded into the flavored whipping cream. This was dumped into a tube pan on top of a graham cracker crust with some of the crumbs reserved for sprinkling on top. This was an AWESOME dessert and my favorite growing up… maraschino cherries on top too. this looks like your Christmas dessert – at least enough information for you to adapt it to what you remembered (if it doesn’t come up as a link just highlight between the cut it and paste in your browser. My son-in-law’s mom made this for a family gathering, so I, too, think it is kinda special! if it still doesn’t show up, go to cooks.com, then search for crown jewel dessert! We call that Broken Glass Salad. This is also known as stained glass dessert. Always wonderful. Can I use fresh banana’s in place of the pineapple? My concern is that the banana will turn brown???? Hi Diana, I would think you’d be able to use fresh banana instead of pineapple. However, I wouldn’t advise it if you don’t have enough people to eat the dessert in its entirety within a few days just because I do think the bananas will turn (although I have yet to try using bananas to make this dessert). The Brown Eyed Baker created a similar recipe using fresh bananas and there are a few people in the comments talking about using fresh bananas. Here’s the link: http://www.browneyedbaker.com/no-bake-banana-split-cake-dessert/ If you do end up using fresh bananas, let us know how it turns out! My favorite dessert was Granny Sawyers skillet cake..Hot from the oven with a little butter pat melting on it. Christmas, Easter, and Halloween were the only time we were allowed sweets, so a cake was extra special, as we gathered in the kitchen, waiting for the buzzer to buzz and watching Granny Sawyer’s cake emerge! Our family’s most favorite dessert is similar to this banana lasagna, but we call it strawberry dream. Graham cracker crust, butter/egg cream mixture, fresh strawberries, cool whip. Yummmm!!!! I will use the cooked type pudding, as I do not care for instant. It’s not that hard to make. My favorite dessert as a child was my mommas old fashion Banana pudding.. She made the banana pudding from scatch and oh how good that made it. Tho mamma gave me directions I tried to make her pudding but it just never turned out like my mamas pudding. Lol. My favorite dessert as a child was my mommas old fashion Banana pudding.. She made the banana pudding from scatch and pored it between layers of vanilla wafers n sliced bananas then beat up sweetened egg whites till stiff and fluffed it on too. Oh how good that made it. Tho mamma gave me directions I tried to make her pudding but it just never turned out like my mamas Banana pudding.. I make a dessert called Rainbow! It substitutes the cold milk with equal parts of ice cream, and I am going to try that! I used to love banana pudding as a child. We would mix Nilla Wafers and Cool Whip in with ours– it was amazing! I love the idea of having this in a BIG dish for the family to share (because sharing desserts is not easy at my house either)! I wonder if you’ve ever tried it with vanilla ice cream? I bet that would be good. Big hit at Super Bowl party. Added crushed walnuts on top. I love marshmallow cream on banana splits. Would that be ok to put in it? Sure, Kathy! We’d certainly think so. That sounds delicious! I have almost the exact recipe in my grandmothers handwriting. The only difference is she added cherries and crushed nuts on top. I have had her recipe for over 30 years. Back then it was called banana split cake. This looks delicious. I’m a huge fan of banana splits, banana cream pie and anything that involves chocolate. It looks like it could serve a crowd, but I’m sure I can convince my roommates to try some! Although, I might substitute the pineapple for fresh banana. Wish I could print the recipe. Hi Phylis, You can print the recipe! We suggest that you go to the page and highlight the text, then right-click on it. You’ll get a window that gives you the option to “copy.” Do that, and then paste the text into a word document. You should be able print that document that way. Another option is to highlight exactly what you would like to be printed. Then, select “print” from your drop-down menu, and change your print range from “all” to “selection.” Hope this helps! Thanks for the recipe. I saw it on Facebook and I made it to carry to a potluck tomorrow. Sounds delish! Reminds me of another recipe that is made with flour, butter and pecans then baked. A cream cheese mixture is the next layer. Chocolate pudding is the next layer. Final layer is cool whip. You asked about a favorite desert. My grandmother use to make a raisin cake that was awesome. It was never written down because it was in my grandmother’s head. My grandpa and my aunt tried to recreate it but couldn’t. Not necessarily my favorite but a great recipe nun the less so sad! This looks so delicious! A few summers ago I worked with a pastry chef and came out with an obsession with banana desserts! This seems like a really delicious take on banana splits! I loved the story of your developing relationship with desserts. I think everyone has that one dessert that nobody else is ever going to get. Thank you for sharing! I absolutely love this idea!!! I made lasagna in the house all the time, and always wondered how I could make a dessert form! I have made a napoleon dessert that includes graham crackers, vanilla pudding, and chocolate, and it is similar to the idea of banana split lasagna! Definitely printing this recipe to add my list of things to make! Sometimes i add a layer of walnuts and another of whip cream fir fun! I want to make this with real whipped cream. I looked through the comments and didn’t see that anyone tried it. Whipped cream is so much better than cool whip which has no cream in it at all. I used fresh whipped cream in place of cool whip and it turned out great! My family loves it ! Big mahalos for this recipe! Made it last night with only one change: I added crushed Nilla Wafers on top of the fruit layer. Tastes JUST like a banana split! Next time I make, I am adding some fresh bananas with the strawberries and pineapple. Hi Elaine, The ingredients are slightly difficult to get out of the dish after they’ve chilled (especially the graham cracker crust), so lightly greasing it will help you when you go to serve the dessert. I hate cream cheese, would there anything I could use as a substitute? Looks like a delicious desert. I think I can eat instant pudding as look as it’s not diet can’t eat diet stuff the chemicals bother me. I am actually better to make a pudding from scratch. If something doesn’t agree with me I get little red dots on my face near my eyes and my eyebrows itch and the skin gets red. It’s like I’m allergic to some chemical they put in the stuff to preserve it. Maybe I could make a vanilla pudding. I will probably put sliced bananas in and put real cut up pineapple and I like the idea of fresh strawberries. Your desert would taste good with chocolate crumbs too. My favorite dessert my Mother used to make was a lemon pudding she made from scratch and I loved it when she would whip up the egg whites and put them in the pudding and it looked frosty. She even could make a sauce that would go on top and I think it was made with egg yolks, it was OK but I liked it best without the sauce. One more favorite dessert was her banana cake and it was a Never Fail Banana cake and was so good and she used to put this really neat topping on it with nuts and coconut made with brown sugar. It was like a praline topping. This looks sooo good! I can’t wait to produce it for the family July 4th picnic. Thanks for sharing it. My mom was a real eagle-eye when it came to healthy desserts for the bulk of the year, but for holidays she was a fantastic baker. One of the best things she’d make would be a scratch chocolate cake with chocolate frosting. Just made this desert and its in the frig now cooling off. going to try it out on the family tonight ,will let you know the results. By the way if people are worried about the bananas turning brown all you have to do to stop that is to soak your bananas in lemon juice for a second then dry them and this will stop that. who makes fake banana pudding these days? why not make the real stuff? I detest banana pudding made from a box. I will definitely make my own custard pudding just like I do for a homemade banana pudding. Will also add sliced bananas. If the title has banana in it there should be some real banana and not the fake taste that is in banana pudding mix. I will tweak it to my liking but sounds delicious minus the pudding mix. This looks delicious! I’m currently on a diet for a wedding I’m in, so I’ve been trying to find ways to make yummy foods while still keeping my calorie count down. I would try this with Stevia instead of sugar, because that cuts quite a few. I wonder if applesauce would be a good replacement for the butter in this recipe, even if it’s only half butter half applesauce? All of the fruit looks so delicious, and the ingredients are very simple ingredients that are easy to find. I will definitely have to try this recipe out soon! I love the ideas of adding more chocolate to the recipe at the end! A chocolate version would be fabulous! You don’t have a calorie mark. How many calories are in this? I am going to use choc and van for one of these (1/2 and 1/2) and put marshmallows on top (or Fluff or serve plain and add Reddi Whip to serving) cuz I don’t like Cool Whip. I can’t print from my tablet so I use the camera in my phone to take photos of recipes I like and then get the pictures printed. There are all kinds of way to print things out if you really want them and stop to think about it. Here’s another idea, freeze it between layers and add some chocolate Magic Shell ice cream topping before the next layer. You’d get a nice crisp layer of chocolate between the other layers. Bit more lasagne-like that way. I made a dessert similar to this in consistency. Cream Puff Pie. Never do on a hot day. I found that if you freeze it, by the time you get to where you’re going or even just to the table for dessert, it defrost pretty quick and it is easier to cut and slice and serve. Wondering, can this be made with cooked pudding? I hate the taste of instant pudding.